If you want to avoid injury, it always pays to warm up before participating in strenuous physical activity. With the weather turning colder and wetter, fitness enthusiasts will be changing their routines. Many opt for the weight room. Some hit the slopes while others may choose a daily walk, either at the mall or at a nearby park. Whichever activity you choose, sports medicine can help you to avoid injuries. 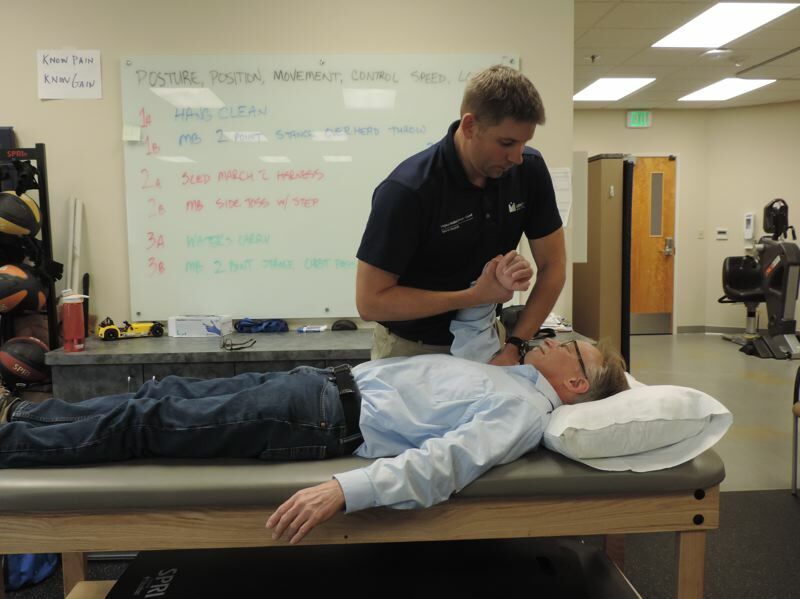 In describing sports medicine, Dr. Thomas Lyttle, an orthopedic clinical specialist with Legacy Health, said, "I think there are a lot of different ways people use the term (sports medicine). I think sports medicine really has to do with the focus being on treating the active population." Lyttle, who is a doctor of physical therapy, added, "Sports medicine is a specialty that focuses on the prevention and treatment of injuries related to exercise and sports performance." At Lyttle's clinic, Legacy Medical Group — Orthopedics and Sports Medicine in Beaverton, sports medicine takes on several tasks, including sports physicals, treatment of sports injuries, athletic training, injury prevention, physical therapy and rehabilitation. One problem Lyttle encounters is rotator cuff injuries. "The rotator cuff is the active control system for the shoulder, in other words, it checks the force being enacted on the humerus (arm bone) by the mover muscles to keep your shoulder together," he said, noting cuff injuries can happen in any sport or activity. In addition to an increase in injuries related to school sports, Lyttle said. "We see an uptick in the number of people coming in with more traumatic injuries (such as knee injuries from skiing or snowboard injuries). Injuries in sport often have a lot to do with people oversimplifying what is actually a fairly complex set of movements." Specifically, hitting the ski slopes can prove problematic. "In terms of orthopedic (musculoskeletal) injuries, the knees are always a big one for skiing," Lyttle said, noting with snowboarding, you see more upper extremity injuries (wrists, elbows, shoulders). Head injuries are another problem that can increase this time of year, thanks in part to "self-projectile" sports such as cycling or skiing. "The potential to hit your head is markedly increased with increased speed, especially when there are other people out doing the same thing. We have a concussion program through our clinic here," Lyttle said. How can we prevent some of these injuries? Lyttle suggests that you wear head protection, avoid sports that put you at a higher risk (if you so choose) and make good choices. "I always preach warmup," Lyttle said. "I think warmup is one of the most underutilized safety mechanisms in sport. I think that's a place where people can maximize their prevention." Noting it's hard to generalize, Lyttle recommends "a good warmup that is typically going to consist of something dynamic and that's going to work on taking you through some of the movements you are about to perform so that you can get those tissues warmed up and those movement patterns warmed up." He added, "Getting in to see a physical therapist, or an athletic trainer, or somebody who can teach you those patterns, is important – sometimes people can do this on their own, but it never hurts to have a second set of eyes. I worry about people getting information online because there's all kinds of junk out there alongside the good stuff." Some people may ignore pain. That's not a good idea. "If there is any kind of knee pain or back pain, I think people tend to say, 'Oh, it's not a big enough deal to get seen yet,'" Lyttle said. "No, no. Come in and get seen. I think most physical therapists and athletic trainers would agree, Let's get you in. Let's get you taken care of." Your primary care doctor is also important. "We're trained (sports medicine) to screen people who have problems to make sure that they fall into our realm, or our practice, in terms of what we can manage," Lyttle said. "If anything comes out in my assessment that looks medical and non-musculoskeletal, then I refer them to a physician. They always need that blessing." Lyttle adds this bit of advice, an oldie but a goodie: "An ounce of prevention is worth of pound of cure."